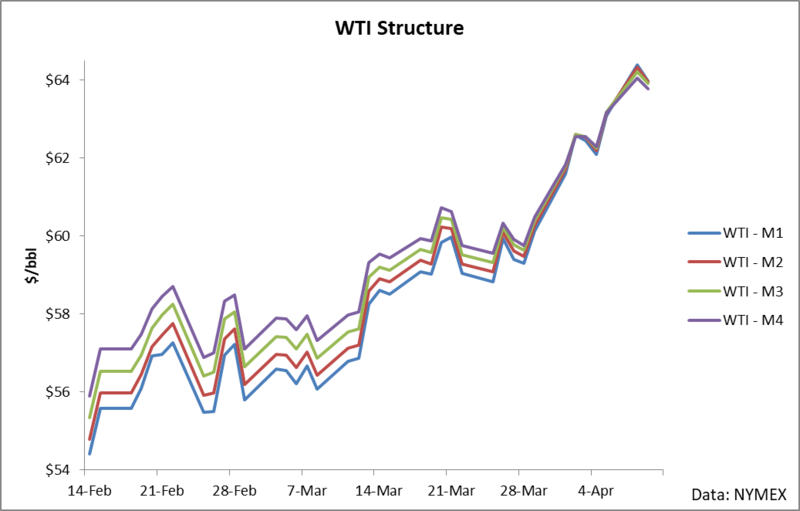 The crude fundamentals are now bullish, and immediate catalysts suggest that bullishness will remain at least through summer. WTI market structure has switched into backwardation, which means that ETFs which are required to roll exposure will be gaining from roll yield. OILK utilizes active management for handling roll exposure, which means that we don't know exactly what ProShares is doing, but the realities of backwardation are inescapably bullish for OILK. One month ago, I wrote an article on the ProShares K‑1 Free Crude Oil Strategy ETF (OILK). In that article, I pointed out that the two main benefits which the ETF claims to offer investors are K-1 free investing and an actively managed roll yield process. In this article, I will give an update to this analysis and, in particular, focus on the active roll component. It is my belief that investors who use OILK as their preferred investment vehicle stand to benefit in the coming months as the market enters backwardation once again. Let's do a quick recap of the advertised benefits of the OILK ETF. First, ProShares offers it in a format which prevents investors from needing to file a K-1 with their tax returns. Tax strategy is not the purpose of this article, but if this is something you're learning about and considering employing, I'd recommend you read this. The second benefit of OILK is that it actively manages the roll. As I pointed out in my last piece, this is a double-edged sword for holders of the ETF. The reason here is that roll yield isn't always a cost, it is also a benefit during periods of backwardation. And, if you are actively managing your roll and shifting exposure to later months, the effects of the gains from front-month roll yield will be greatly reduced as the curve tends to flatten in back months. Essentially, this is the main problem with an actively managed rolling process - it reduces the downside, but it can also reduce the upside. The methodology is proprietary, but during periods of backwardation, ProShares would maximize gains through lengthy rolling periods concentrated in the front futures contracts. Its methodology leads me to believe that they are simply trying to reduce any and all impact from the roll through investing in later contracts, which means that they probably are not seeking to maximize return but rather just reduce all forms of roll yield. This said, if you are investing on your crude thesis through OILK, it is my belief that now is a good time to buy the instrument. My reasons are twofold - first, the fundamentals are now bullish (and have been so for several weeks), and second, the market structure is just now in the process of switching to backwardation, which means that your position in OILK is now set to benefit from roll yield. Even though ProShares seems to seek to minimize roll yield, during periods of backwardation, roll yield will serve to appreciate the underlying price of the ETF. To jump right into the main thesis, let's have a brief talk about crude fundamentals and what's happening right now in the oil markets. First, if you haven't looked at crude fundamentals in a while, it really is a pretty volatile year. Looking at a year-to-date balance for crude inventories as compared to other years will concisely show the picture. 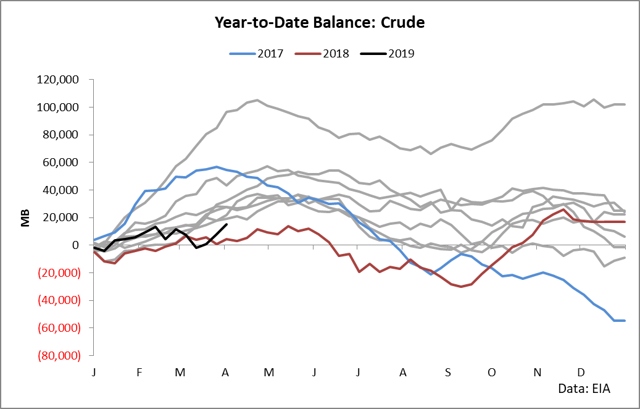 Through mid-February, crude inventories (which represent the net fundamental balance of oil) were largely in line with historic fundamentals. However, from there, volatility entered the fundamental picture as inventories began decoupling from historic norm and fell into one of the largest year-to-date declines ever seen at the beginning of March. Immediately after that, we witnessed a few substantial weekly builds which have brought inventories back up, but they still remain beneath historic levels for this time of year and this season. If you've been watching the weekly stats, inventories have seen historic moves both to the upside and the downside throughout this year as seen in the following 5-year range chart of weekly inventory builds and draws. When the fundamentals started decoupling from historic trends (in mid-February), we saw a series of 3 of the next 4 inventory releases strongly bullish and well outside of historic ranges. 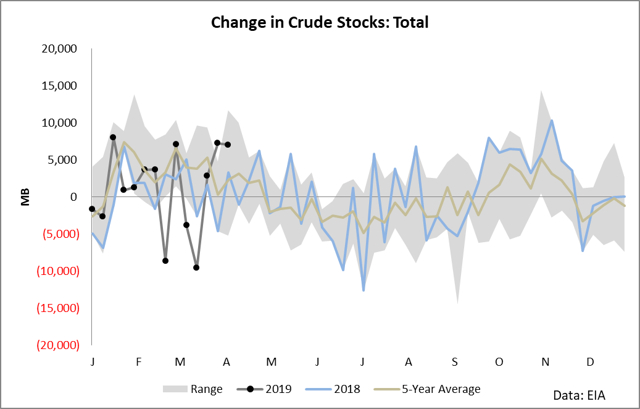 These draws have been followed by a series of strong builds in which two of the last three weeks have seen increases in inventory either above the 5-year range or well above the 5-year average. The main two main culprits and sources of volatility here are refining runs and imports. 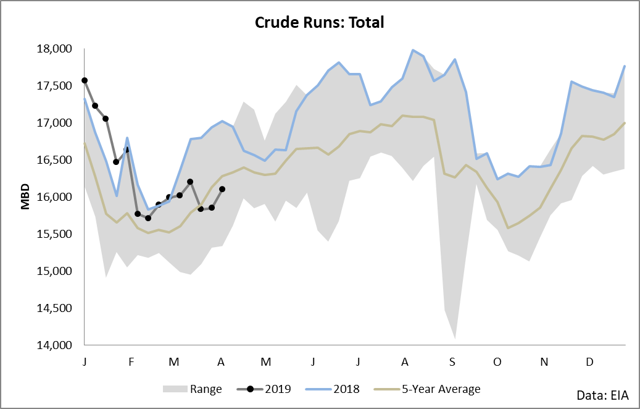 Refining runs were very strong in February and March, but as of late, they have fallen back toward the 5-year average (which is really a sign of weakness in that capacity increases in most years). And, imports have declined pretty strongly starting at the beginning of February. 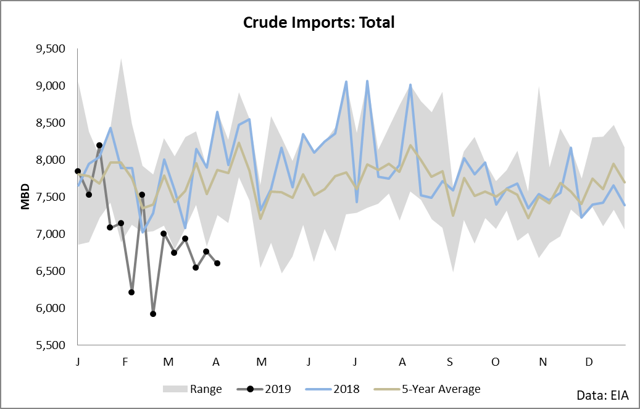 Indeed, since the first week of February, all but one week of imports have been beneath the 5-year range, which represents a substantial volume of crude oil. To run through the math - since the first week of February, imports have averaged 921 thousand barrels per day less than the 5-year average, which means that the 63 days since the recent EIA release and the first in February represents over 58 million barrels, which have not come into the domestic crude balance versus historic norms. A simple look at the 5-year range of historic inventory levels shows that this volume alone is the difference between another year of oversupply and inventories flattening and falling beneath the 5-year average. Putting all of these variables together, we can say the fundamentals are currently bullish. When inventories are falling, prices tend to be rising. As long as imports remain weak, we are bound to see draws continue. Recent weeks have seen inventory gains which we can attribute to lower refining runs, but as I have previously argued, refining cracks are strongly indicative of increased runs in the immediate future. When it comes to the OILK ETF, our analysis would not be complete without a discussion of the fundamentals and how they relate to the roll-yield component. First, when the market is bullish, it tends trade into backwardation as seen in the following chart. 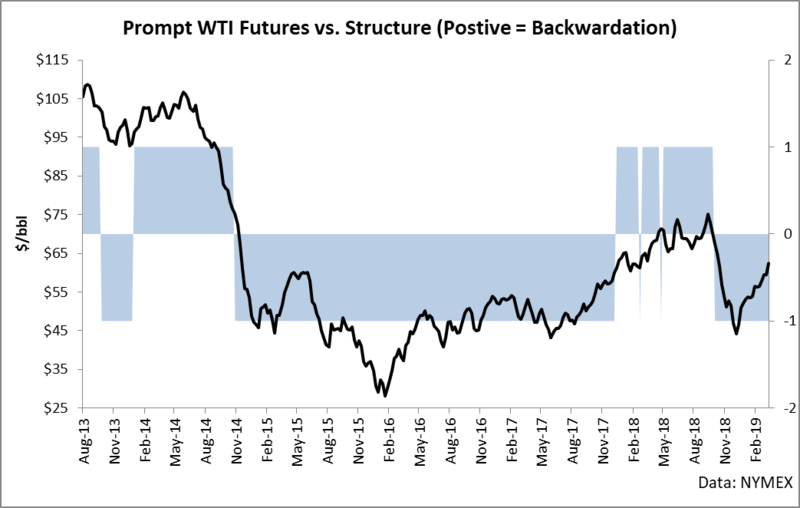 This chart shows the front-month market structure reduced to a simple signal (1 = backwardation, -1 = contango) overlaid versus the flat price of WTI. As you can see, there are clear market regimes in which bearishness is associated with contango and bullishness is associated with backwardation. The picture is not always perfect, and at times, it does lag the trend, but it gives a useful picture in that we can assess the general trend simply through market structure. This chart digs a little further into the relationship between market structure and price trend. 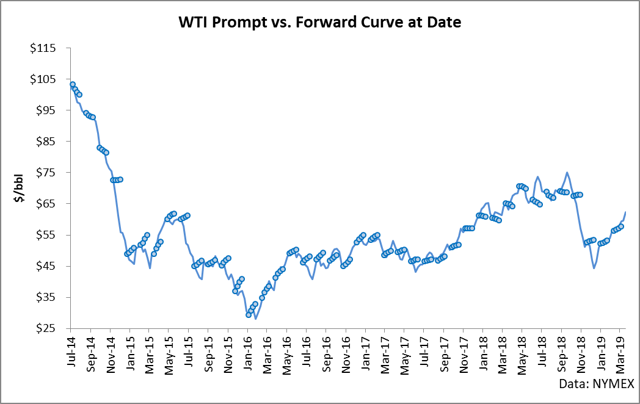 It takes a few seconds to become oriented to this chart, but it shows the front month price of WTI futures and the forward curve at any given date moving into the future. The strength of this chart is that it shows not only the relationship of market structure at any given point but also shows the conviction of this relationship as well as the underlying shifting dynamics in the forward curve. For example, in late 2017, we saw the crude markets enter a period of bullishness that lasted until late 2018. During this period, we saw the market structure slowly switch from contango to backwardation and then to steep backwardation. Immediately before price began falling in late 2018, the market flattened and switched back to contango, and we've been in a contango regime until a few days ago. Here's where things get relevant to holders of OILK. As you remember, OILK benefits from the roll yield when the market is in backwardation. If ProShares was seeking to maximize earnings for OILK holders, during backwardation, they would maximize holding times across the front contracts to earn the yield as back contracts converge towards the front. We don't know their methodology (and I speculate they are actually just trying to reduce exposure, not maximize gains), but regardless of whatever methodology they employ, they cannot escape the reality of roll yield. We have just entered a period of backwardation over the last two weeks as market structure has finally caved to the bullish thesis at work in crude. This backwardation, as long as it exists, will benefit holders of OILK as roll yield adds to the bottom line of holdings. 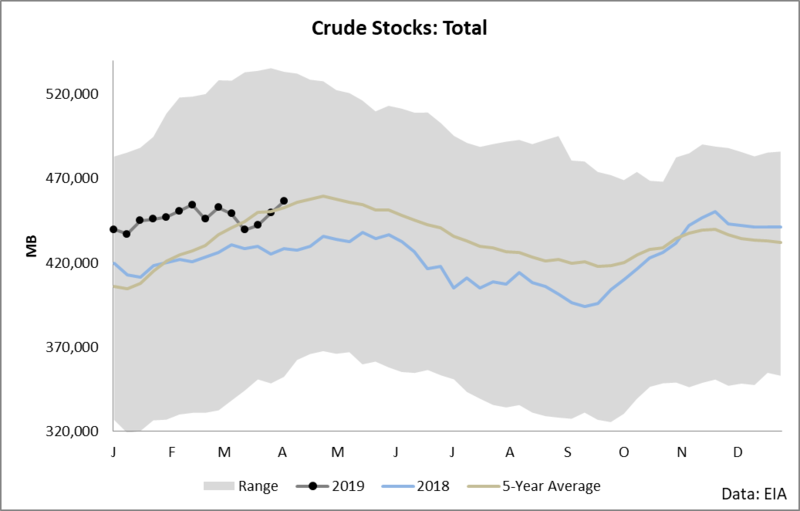 It is my belief that we will see bullishness last through the end of summer driving season since we are entering a period of higher demand with substantially pent-up demand in the form of lower refining runs and higher cracks already in the mix. During this period, I expect backwardation to dominate market themes and general bullishness to remain. This doesn't mean that every week or month will see price increases, but I anticipate breakdowns in the trend to result in further legs upwards. This ultimately boils down to an excellent time to hold OILK if it is your preferred instrument.